Nissin, a popular manufacturer of compatible flash guns for DSLR has released a flash for Micro Four Third systems – the Nissin Di466. 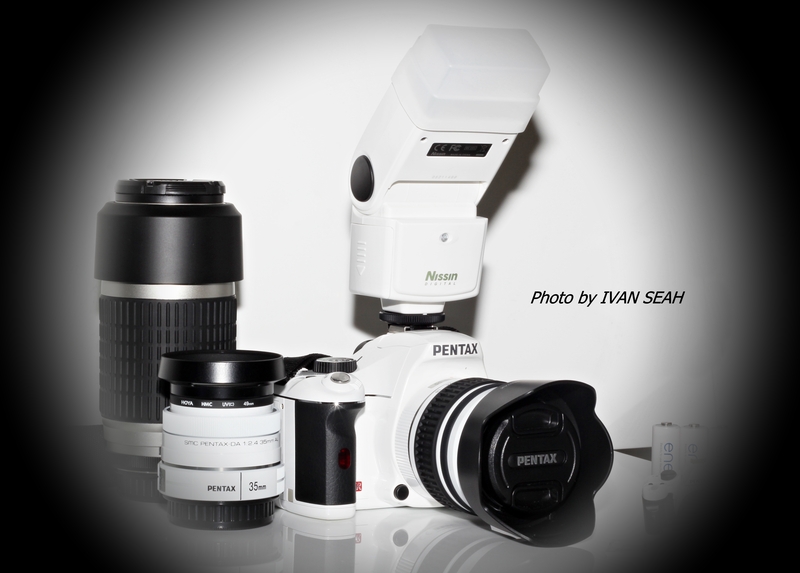 And the latest incarnation is in a mean white – yes, you heard it, a TTL-compatible flash in White Color housing. No need to speculate, we all know that most Micro 4/3 camera bodies now comes in various colors – think Olympus’s Pen series, Nikon’s recent V1/J1, etc. This white bodied flash will be popular for those looking to get a matching colored flash, that is – for the fashionable shooter. Picture by Yu Ling (SJS). 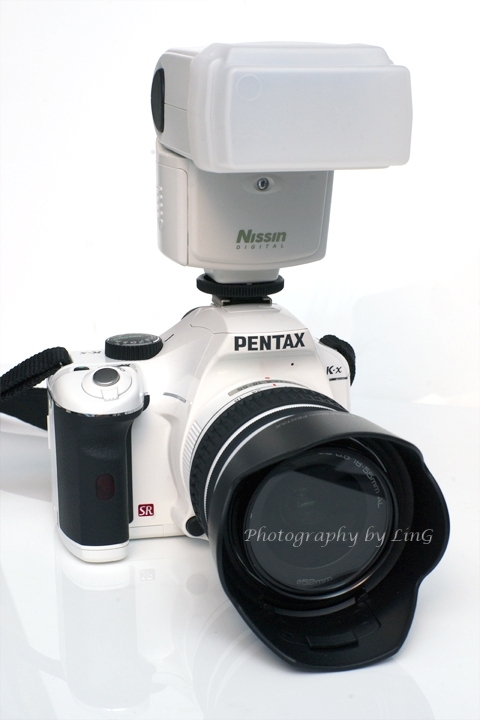 – The NISSIN Di466 M43 Flash fits nicely on my White Pentax K-X. Although the Di466 is designed and made for Micro 4/3 systems, it features a standard “center trigger” pin beneath the contacts and this means – the Di466 M43 flash is suitable for use with all regular DSLR (except Sony Alpha) in manual mode! 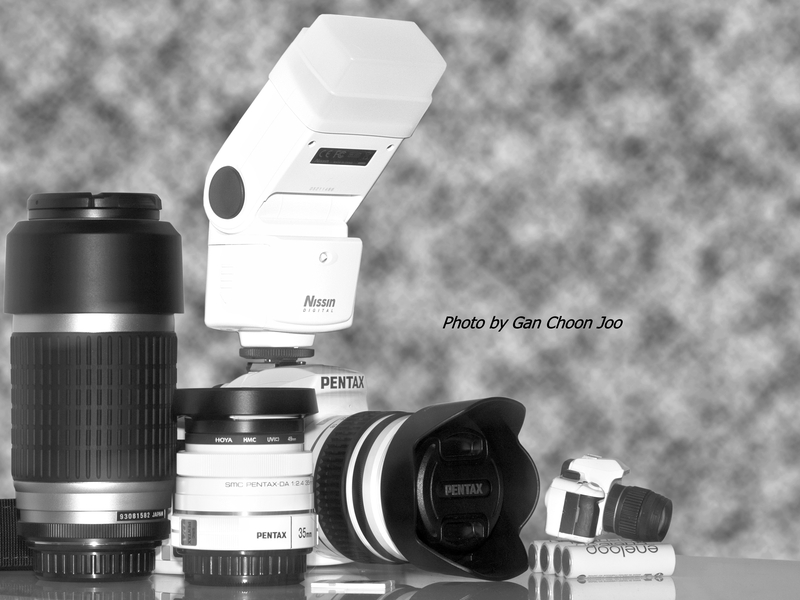 Maybe the users from Canon & Nikon may not really be impressed – but over at Pentax’s camp, there is a cause to rejoice. 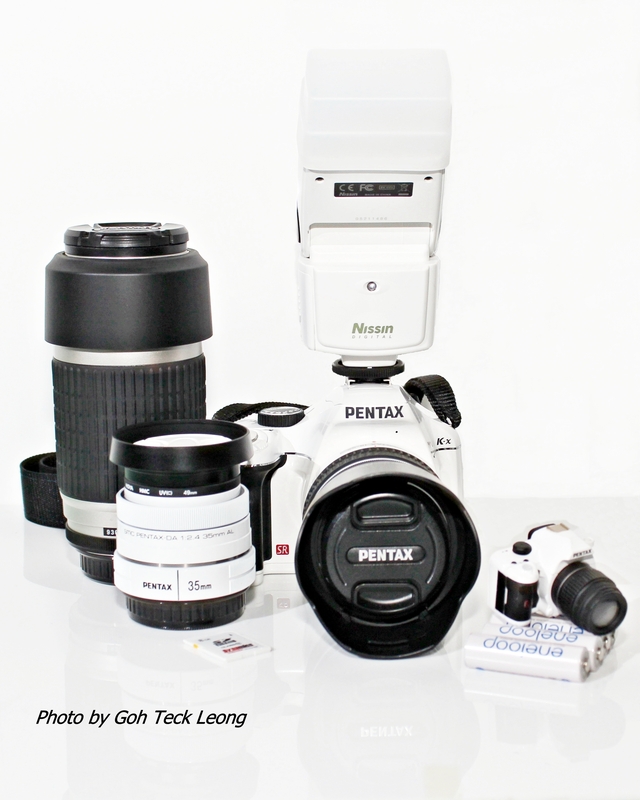 Remember the colorful Pentax K-M, K-X & the recently delisted K-R? Picture by Goh Teck Leong (TPCC). – The White Arsenal. Well I happened to have a white Pentax K-X which is my “leisure” camera. (Those who have been following my reviews will know that I use my Nikon & Canon mostly for my commercial works.) Since the camera came in white, I had gotten myself a set of white accessories to “match” the camera. 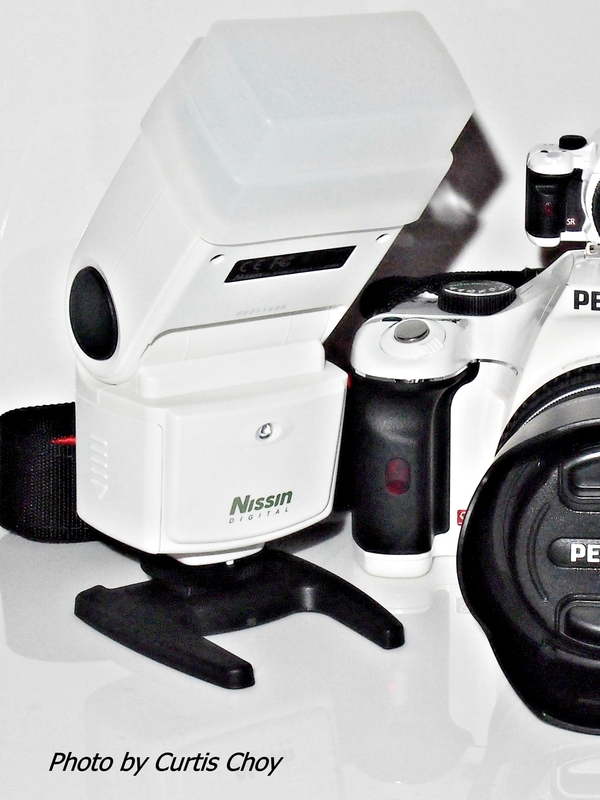 I have a set of white eneloop rechargeable batteries, a white Toshiba SD Card, a white miniature Pentax hotshoe cover, another white Pentax DAL 35mm F2.4 with matching white lens caps apart from the supplied white DA 18-55mm kit lens, an metallic white, silver-ish 70-300mm lens and now, the white Nissin Di466. Picture by Curtis Choy (TPCC). – The White Nissin Di466 M43. The flash fits into the hotshoe nicely without force, and the locking screw locks the flash as expected. And of course, when I switch on the camera & the flash and tried shooting, it fires nicely. Although the TTL does not work on this DSLR, I am perfectly fine with it and happy to use it in manual mode. I started with Manual flashes anyway, so it does not irks me in any way. The guide number is set at 33, but in reality, the flash feels like it has a guide number of approximately 45. Like any other flash, you can “slave” it using optical sync – in layman terms, you can use your pop up flash and have the Di466 placed away from your camera (set to S1 or S2) and use your pop up flash to trigger off the Di466 – very useful. Picture by Gan Choon Joo (TPCC). – The White Arsenal. 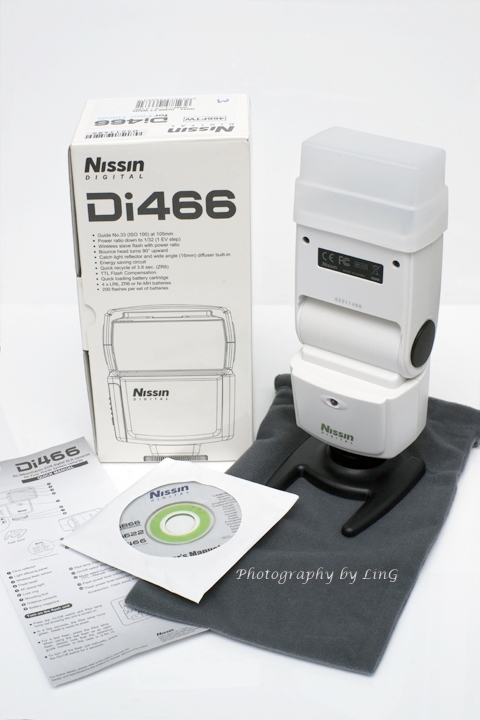 I bought my Nissin Di466 from http://www.reddotphoto.com.sg/ get yours too! Picture by Ivan Seah (TPCC). – The Stormtrooper’s New Issues. Remark: Some camera models are originally programmed to disable the AF assist light function. This entry was posted in Brand: Nikon, Brand: Olympus, Brand: Others (Cosina, Carl Zeiss, Leica, Mamiya, Samyang, Vivitar, Zenitar,etc), Brand: Pentax, Photography Articles & Videos, Uncategorized and tagged Micro 4/3, Nikon, Nissin, Olympus, Pentax, Photography Accessories. Bookmark the permalink.